A busy family bathroom would benefit from having twin basins, bath and separate shower enclosure if space permits, but a guest en-suite may simply need basin, toilet and shower. Sketch out the plan, identifying the layout of key features such as the door and which way it’s hinged and opens, window positions including height to sill, the overall height of the room and where current fixtures and fittings are, plus soil stack. If you know which way the floor joists run, make a note of that too! Identify your ‘must haves’ in order of preference. For instance, is a stunning sit-on basin your main priority, or do you want a spacious shower enclosure with drench head, handset and body jets? As the average British bathroom is the same size as a king-sized bed, remember to be realistic with your wish list. Twin basins or a roll-top freestanding bath won’t create a statement if they won’t fit! Moving water and waste pipes can be expensive. Don’t simply change the overall layout of you bathroom because you’re updating your old one. 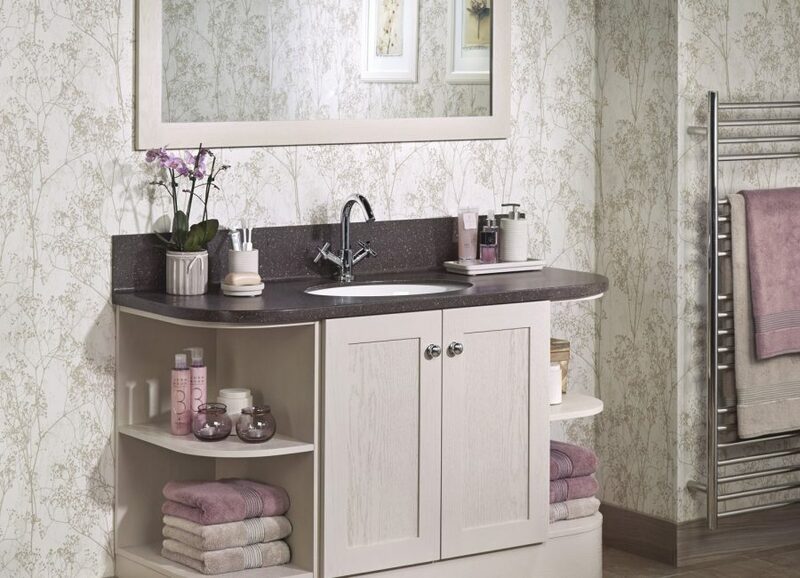 Key to having an ongoing beautiful bathroom is storage. You may well endeavor to keep a new bathroom tidy initially with matching towels and co-ordinating toiletries, but all too soon it will become cluttered. Having plenty of concealed storage in drawers or cupboards, plus a dedicated space for cleaning materials for an orderly space. Often overlooked, lighting should be functional, directional and ambient. Whether applying make-up, getting up in the middle of the night to visit the loo, or lowering the lights to relax in a bath, there is no single light that can do all three! Condensation will always occur in a bathroom, so adequate ventilation is a must for both keeping your furniture pristine and also to validate your guarantee. An open window simply isn’t enough to clear the condensation and an extraction fan must be always fitted. At Vanity Hall, we want you to enjoy your bathroom for years to come. We would always recommend that you work with a bathroom designer who can plan your bathroom to the smallest detail and help to avoid unnecessary additional costs and changes along the way.